Observations from NASA's Galaxy Evolution Explorer (GALEX) picked out 30 elliptical and lens-shaped "early-type" galaxies with puzzlingly strong ultraviolet emissions but no signs of visible star formation. Early-type galaxies, so the scientists' thinking goes, have already made their stars and now lack the cold gas necessary to build new ones. Hubble images captured the great, shining rings of ultraviolet light, with some ripples stretching 250,000 light-years. 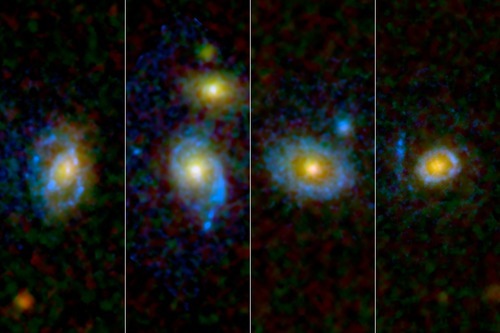 In these Hubble images, ultraviolet light has been rendered in blue, while green and red light from the galaxies is shown in its natural colors.